Owners today are caught between environmental issues and attempts to make money. Owners today are caught between environmental issues and attempts to make money in a prolonged market slump. What will it result into? In addition to the tightening Emissions Control Regulations and historically high bunker prices there appear more and more bunker related issues, which put additional pressure on the shipowners. The Energy Efficiency Design Index (EEDI) will be mandatory for new ships and the Ship Energy Efficiency Management Plan (SEEMP) is mandatory for all ships from 1st January 2013. The EEDI estimates ship CO2 emissions per ton-mile of goods transported relative to a reference average of similar ships and is aimed at promoting the use of more energy efficient engines which will cut emissions. According to the IMO, the EEDI "is expected to stimulate continued innovation and technical stimulate continued innovation and technical development of all components influencing the fuel efficiency of a ship from its design phase." The standards will be strengthened over time, with the aim of a 10% improvement for ships built in 2015-19, 15% or 20% for 2020-24 depending on ship type, and 30% for ships delivered after 2024. In addition, some of the world's leading charterers announced a new fuel efficiency rating system to be known as the Existing Vessel Design Index (EVDI), an initiative to benchmark efficiency ratings for all types of ships. The index rates vessels' greenhouse gas emissions and energy efficiency from A (most efficient) to G (least), when compared to ships of a similar size and type. More and more charterers adopt this scheme. That means the ship owners have to invest huge sums of money to upgrade their vessels to make them meet all the requirements of international regulations and big charterers to get access to the cargoes. In a market when earnings are at rock bottom levels and values are heading down as well, we are likely to see a shift towards a two tier market in most sectors. I.e. owners of modern tonnage described as "ECO ships" will increasingly promote their tonnage as environmentally friendly to push the least efficient tonnage into areas with the least environmental regulations. Even more tonnage will be consigned to the demolition yards. Balancing demand and supply though might take a long time. The most vibrant example from the recent past is the tanker industry, which went through a recovery period of 20 years to get balanced after the 1979 oil shock. 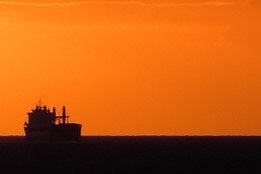 A boom and bust scenario is nothing new for the shipping industry and, those who play the game should remember this to adapt their strategies.